It’s nearly spring and now is the time to be bold and have fun with your clothes! Our Boutique is bursting with colourful tops, bottoms, dresses, jackets, and unique pieces to pull together a multitude of looks for any occasion. Whether you're dressing for work or play, you will find your style here! Remember to shop for spring and summer now for best size and style selection. Marble’s new collection has started to arrive at the Boutique! This line arrives in colour groupings for the next few months so there is always something fresh to discover. 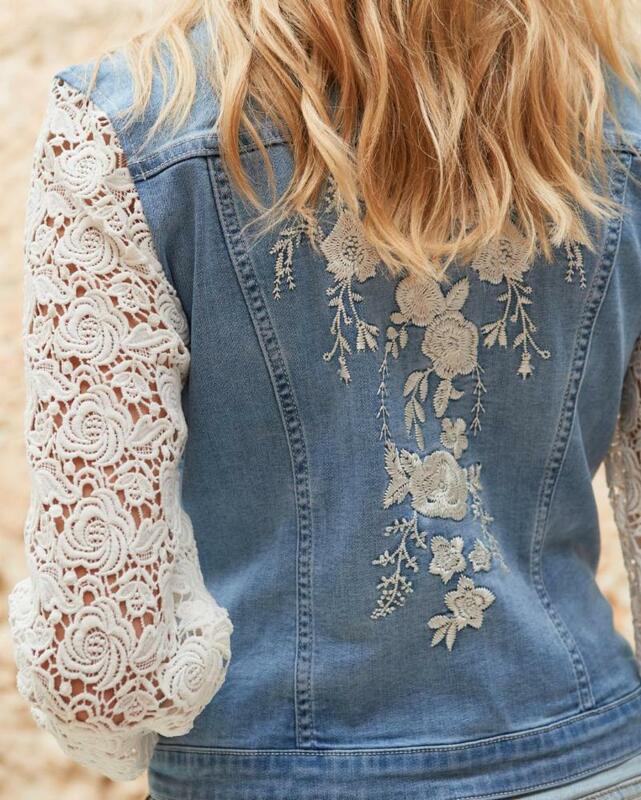 This new season features even more natural fabric blends than before, plus lots of details! 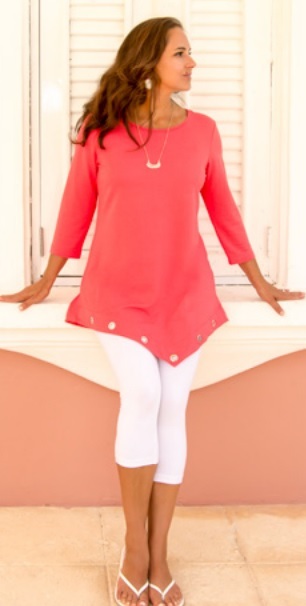 Featuring bracelet length sleeves to make it easy to stay cool but covered; coconut buttons that enhance the natural fabrics; and touches of fringe to keep things feminine and fun. Be bold with an open shoulder or keep it classic with a "My Marble" tried and true silhouette. Choose styles that you have come to love from Marble or explore their new and exciting styles to satisfy your adventurous side! Marble is happy to be able to offer you the best of both worlds for Spring/Summer 2019. If you'd like to be notified as soon as each shipment of Marble arrives, please let us know by calling 250-751-7799 or visiting us at the Boutique. We nearly have FDJ’s spring collection in its entirety! We have a huge selection of their colourful denim in soft pink, silver, and all shades of blue. Fringe hemlines and pretty embellishments feature prominently on everything from jean jackets to t-shirts to pedal pushers and more. Curious about your fit? Take the FDJ Fit Quiz on their website. Highlights of this collection are pictured above including the lightweight tencel denim dress, a flowy tropical leaf print blouse, the lightest denim ankle pant with fringe bottom, macrame shoulder t-shirts, and the cascading butterfly print top. The Olivia slim ankle striped pant is a great way to wear this season’s trend of stripes! Ribkoff’s Collection has something for every woman! From fun styles to timeless classics, every piece is special and designed to make you feel and look your best. Have you shopped the Joseph Ribkoff Handbag Collection yet? A reminder to our customers, if you see something you like online from this brand, please give us a call and we will order it in for you with no shipping cost. 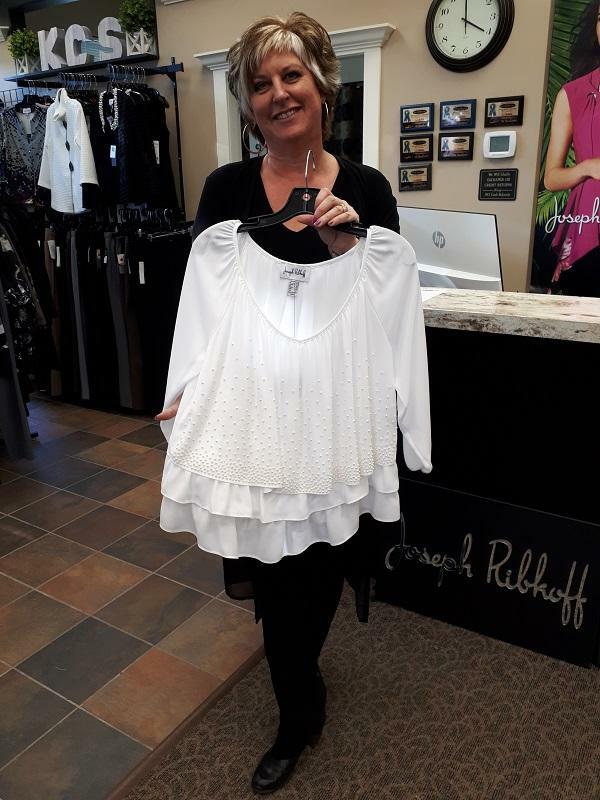 Joseph Ribkoff provides us with exceptionally fast service as we are one of the leading retailers of this label in British Columbia, plus we are Nanaimo’s only source for this line. If the item is still available, it will arrive promptly at our Boutique for you to enjoy backed by our return policy and award-winning service. We have a selection of bamboo tunics and sundresses from Pure Essence including this tunic in black and emerald green. This line is made in Canada. 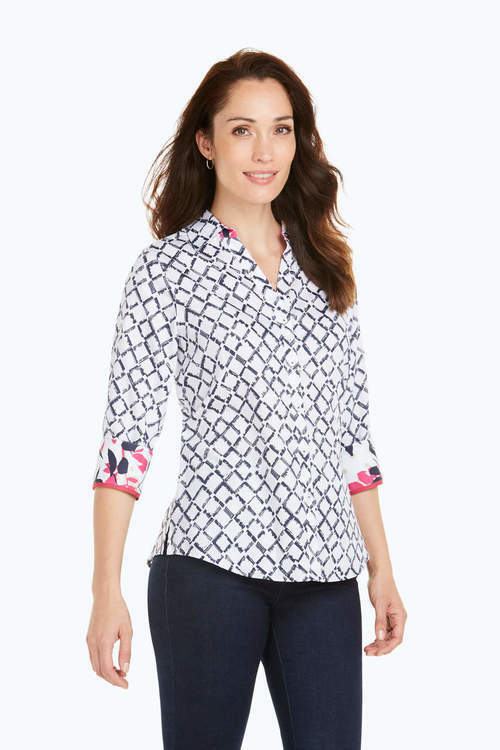 Foxcroft Petite Blouses in 6 new styles and colours are available now. 100% cotton and no-iron blouses cut in the right proportions for women 5’4” and under. Renuar is a favourite for petite ladies - no hemming required with their famous 27” pull-on ankle pant! This collection features mid-rise, slim fit bottoms, fashion colours, and breathable fabrics. We have Bermuda shorts, skirts, and crop pants with or without pockets. The pocket style crops are popular with golfers. Colours include lavender, light olive, black, white, sand, Prussian blue (picture), and aqua! We love the artsy styles from this label and the casual sundresses are a favourite! You’ll love their fit in breathable natural fabrics. We have a limited quantity of reversible maxi dresses that are two styles in one, plus they come with a scarf doubling as a pashmina. Come in and see these dresses that are perfect for travel and summer weddings. 3 styles available. Our Fashion for Compassion Fundraiser Fashion Show is on Sunday, April 28th from 1-4 PM. This event supports Nanaimo Community Hospice and always sells out! Come in to pick up your tickets or call 250-751-7799 to reserve your table. Thank you! Mark your calendars for our next Joseph Ribkoff Trunk Show on Saturday, May 25, 2019. Is there a connection between MOOD and CLOTHING? After ten years of dressing women and seeing their moods shift after trying on colourful and fun fashions, we don’t need a psychology degree to see the connection between fashion and mood. Throw on happy, bright colours and your mood will improve; you’ll feel like your walking on sunshine! If you’re wearing something drab or that just doesn’t fit or feel right, it’s easy for your style to ruin your day. Dressing your best frees up your energy to focus on other things in your life! Change up your clothes. Do you consistently buy the same styles? Try something new! And don’t forget to change up your wardrobe as your lifestyle changes. Fashion is a great way to express your evolution into a mature, confident woman! 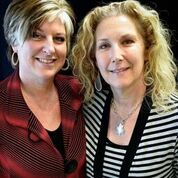 Save time and money by understanding your personal style and body shape. Experienced dressers in an established clothing boutique are well-versed in the right styles and fits for all body shapes. Experiment with different styles, colours, and fits until you find the right balance of what feels good and what looks good on you. When you do find your personal style, put together a mix-and-match wardrobe that makes it effortless and fun to get dressed in the morning. Ditch the baggy sweats and oversize sweaters you may have been hiding under and feel the difference! Buy clothes that fit well. When you wear clothing that evokes positive feelings and flatters your figure, not only will you look fantastic, but you will feel confident too. This spring, add colourful fashion and fun pieces to your wardrobe and enjoy the positive connection between fashion and mood. 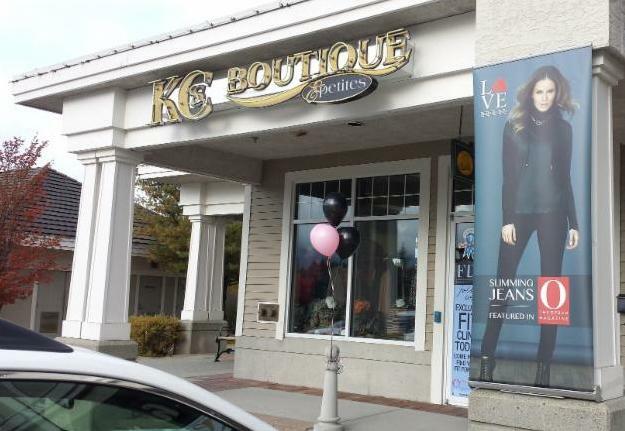 If you're not sure how to find your fit and style, the staff at KC’s are always here to help. Do not be afraid of colour and bold prints this spring! We keep seeing ladies surprised at just how great they look and feel in the latest styles. Remember, we are open on Sundays and new fashions are arriving often so stop in regularly to find your new favourites!